Nearly two years away didn’t slow down Brandon Vera from demolishing former Cage Warriors heavyweight champion Mauro Cerilli in the main event at ONE: ‘Conquest of Champions’ in Manila. 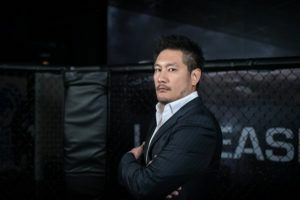 While Vera has been virtually omnipresent at a ton of ONE Championship shows over the past couple of years, he hadn’t been in action since first defending his title in 2016. Despite the long layoff, Vera didn’t miss a step while taking on a hard punching heavyweight from Italy, who was head hunting with his massive meat hooks as soon as the action got underway. As it turns out it was Cerilli’s aggression that did him the most harm as he was constantly swooping forward with big looping shots and leaving his chin open for a counter strike. Sure enough, Vera just stepped back out of the way of one of those huge shots and then countered with a perfectly time left hook that clipped the Italian heavyweight and sent him crashing to the mat. Rather than let Vera unleash a few more bombs, the referee quickly rushed into stop the contest with the end coming at just 1:04 into the opening round. “I’m glad I got that left hook in and dropped him with it,” Vera said after his latest title defense. Vera (16-7-0-1) has looked unstoppable since coming to ONE Championship from the UFC and now the biggest problem will be finding him suitable competition when he makes his next title defense, although dropping down to light heavyweight remains a possibility. Cerilli drops to 12-3. In the co-main event, home country hero Eduard Folayang regained the ONE lightweight championship in a five round fight against Amir Khan in front of a raucous audience at the Mall of Asia Arena in Manila. 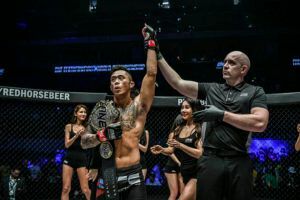 The vacant title was up for grabs after Martin Nguyen surrendered the belt earlier this year and Folayang was eager to get that title back around his waist. Throughout all 25 minutes, Folayang showcased his dazzling array of strikes including several spinning attacks that kept Khan guessing and barely active with his own offensive output. 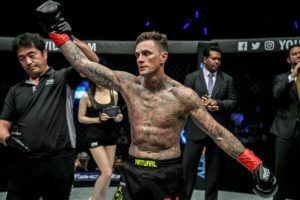 Folayang uncorked a spinning back fist at the end of the second round that appeared to rattle Khan as the Evolve MMA lightweight searched for answers while going up against one of the more creative strikers in the sport. Again and again, Folayang set up his combinations with kicks from the outside and then continued to rush forward with four or five strikes in succession. Khan was stuck playing defense for the majority of the fight while Folayang was just trying to find the perfect opening to land the knockout blow. 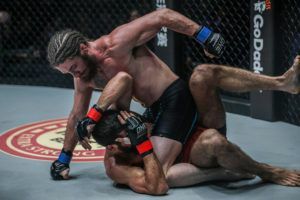 While he couldn’t quite put the exclamation point on his performance, Folayang was in control for the majority of the fight and when the final bell rang there was no doubt that he was going to be leaving with the lightweight championship. Folayang earned the unanimous decision victory and now becomes the fourth Team Lakay fighter to currently hold a title in ONE Championship. 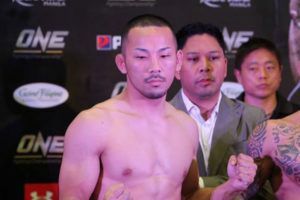 It was the third win this year for Folayang (21-6) as he now looks forward to a very interesting 2019 as the ONE lightweight world Grand Prix will kick off soon and former UFC champion Eddie Alvarez prepares to make his debut. Khan (11-4) is also likely to feature in this tournament. Elsewhere on the card, Honorio Banario (14-7) had a battle on his hands from late notice opponent Rahul Raju (5-4) in a catch weight contest on the main card in Manila but he still managed to pull off the unanimous decision victory. Banario, who was coming off a loss to Amir Khan in his last performance, was looking to impress in front of the home audience but his high intensity output nearly backfired as his lungs were burning by the third round. Raju was constantly looking for the clinch and the takedowns with Banario defending and scrambling out of bad positions. Banario did a solid job countering Raju’s attacks but it was a grueling affair over all three rounds. Finally in the closing seconds of the last round, Banario secured a standing rear naked choke and it looked for a moment like he might actually get the submission judging by the grimace on Raju’s face. Time ran out before Banario could secure the finish but the judges all agreed that he had done enough to earn the win as the former ONE Champion got back on track following a disappointing outing in his prevous fight. 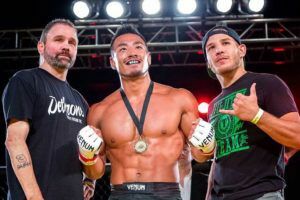 Former LFA champion James Nakashima (10-0) got his ONE Championship career off to a good start as he handled Russian Raimond Magomedaliev (5-1) for the better part of the three rounds to earn a unanimous decision victory in his debut. 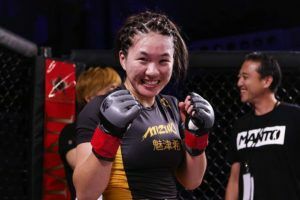 While Nakashima had to endure some strong striking attacks from Magomedaliev early, it was ultimately the wrestling from the former junior college national champion that dominated the majority of the fight. 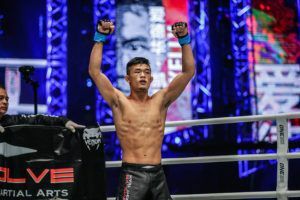 Nakashima was constantly on the attack and finally secured his first real takedown late in the second round as he put Magomedaliev on the ground before advancing to the mount to continue his offensive barrage. 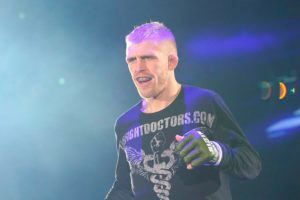 While he didn’t get the finish, Nakashima gained a ton of confidence from that exchange because he stormed out of the gates at the start of the third round looking for the takedown. Once Nakashima planted his Russian opponent on the ground, he remained in complete control as he absolutely smothered Magomedaliev for almost the entire five minute session. Nakashima was blasting away with punches and with each passing second Magomedaliev saw his perfect record slipping away. 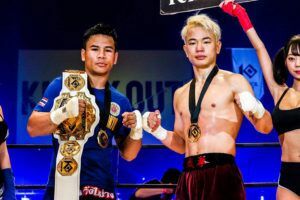 When it was over, Nakashima earned the unanimous decision victory and immediately becomes a threat to new welterweight champion Zebaztian Kadestam. 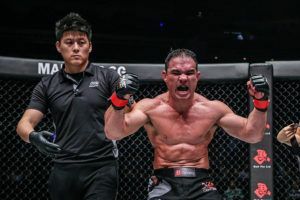 On the prelims, Alexandre Machado evened up his record in ONE Championship with a second round TKO against 45-year old heavyweight Hideki Sekine, who is now 0-3 in three fights with the promotion. ONE Championship will now take a brief break before returning in two weeks time for the final show of 2018, ONE: ‘Destiny of Champions’ in Kuala Lumpur.